A resident clears snow in Manang in this December 14, 2014 photo. 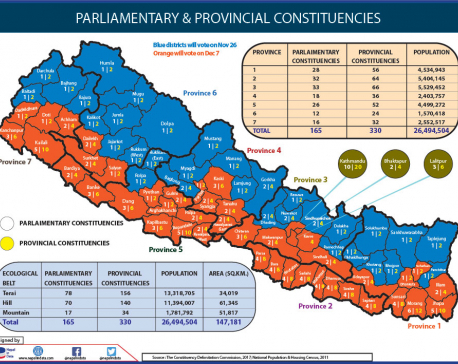 POKHARA, Jan 8: While increasing cold has massively affected several parts of the country and even claimed some lives in Madhes, hilly districts have experienced just the adverse. Farmers in the high altitude districts like Manang and Mustang are lamenting lack of snowfall this winter season. In the past by this time of winter, they would receive snowfall, which is imperative for the growth of winter crops. Apart from agricultural reasons, snowfall is considered to be a crucial factor in attracting huge number of tourists to the Annupurna Circuit. “Foreigners love trekking along snow capped trails. In the past, they would love to spend days trekking in the region and enjoy the snow. 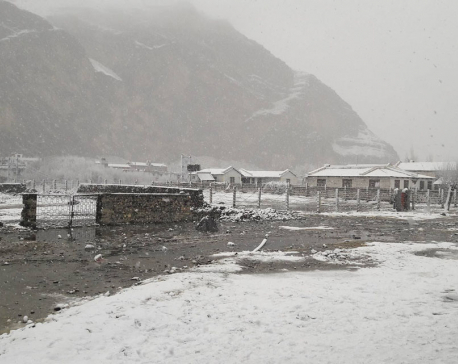 But this time, there has been no snowfall even though it is already January,” said District Administrative Officer of Mustang, Ramchandra Tiwari. “Along with that, lack of snowfall has equally upset farmers. 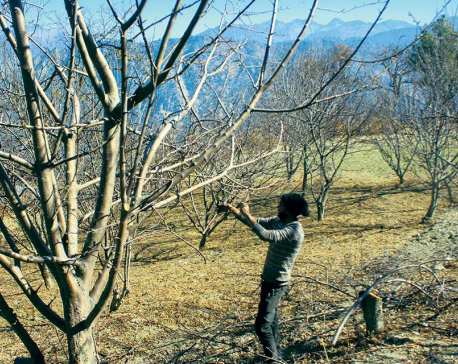 Their crops are drying and snowfall is a huge respite for them,” he added while stating that mountains around the district would be covered by thick layers of snow in October or November. Heavy snowfall would not only please the people. More often than not, it would wreak havoc in the districts due to the road blockage and create shortage of supplies. According to CDO Tiwari, tourists and other on the way would be stranded for days and sometimes, in case of delayed rescue people's live would get into danger. While stating that the upper surface of water in ponds has frozen to ice, he again stressed that the lack of snow even on tall mountains is worrisome. If there is no snow now, it is going to affect farmers later. Along with that, he said, mini hydro projects in the area will be directly affected in days to come. “It is the melting of the snow in post winter that caters to the need of the farmers. Or else, their crops won't grow properly,” Tiwari explained. “It is quite natural to have during this season. But this year, it is quite unusual,” he added. A farmer from Chirang village Kisan Maya Bista lamented the same thing. She stated that her family would starve if this continues. “If it's further delayed, crops won't grow. Later, we won't have food to eat,” she stated. 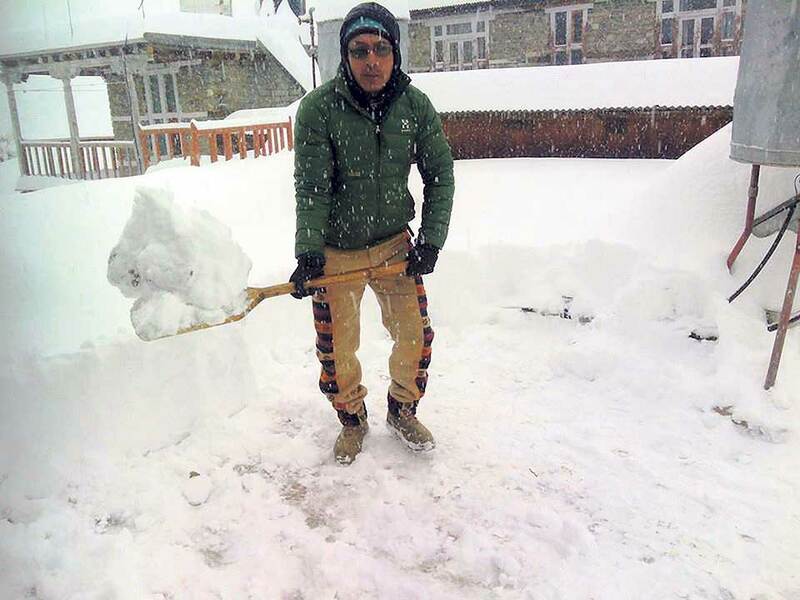 Shiva Pujan Gupta, planning officer with the District Agricultural Development Office (DADO) of Mustang, stated that snow keeps the land wet and that is very important for the crops, fruits and vegetables in the hills to grow. Even if the fields are irrigated with water later, it does not work as effectively as snowfall. “The timing of the snowfall is very important as it keeps the land damp. If there is much delay in snowfall or there is no snowfall at all, yield of the farms will be affected,” he said. Gupta is surprised that there is not even a flake of snow in Mustang. Even in Manang, the situation is equally worst, he said. “I have heard that only some of the tall mountains in Manang have received little snow. Compared to the past, it is nothing,” he remarked.